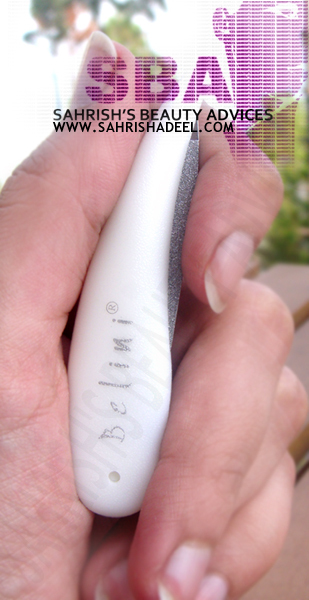 Nail Filer by Belini - Review | Sahrish Adeel - Malaysia based Pakistani Beauty & Lifestyle Blogger! A nail filer is a must thing in your travel kit when you always want to keep properly manicured nails. I recently came across to a nail filer that works great and is perfect to fit in your travel kit without damaging anything in its surroundings. It comes in a packaging like this. As you can see in the pictures, it is fold able (not pointed ends to tear off you bag), this feature of this nail filer attracted me the most. But when I used it, I was really impressed by a neat and speedy result. The filing part of this filer is made up of a high quality steel with the use of modern alloying additives while the white part is made up of plastic. Cost: 125 PKR and you can find it in almost all big super stores. Will I buy it again? A BIG YES! Lemme know what kind of nail filers do you use?